The workers’ compensation industry gets a bad rap for surviving off of people’s accidents and injuries, but there’s something that you have to know. First things first, someone has to do it. Second of all, many of the leaders in this industry only possess good intentions and are fighting for a bigger, more positive cause. A good example of the latter? Carlos Luna. 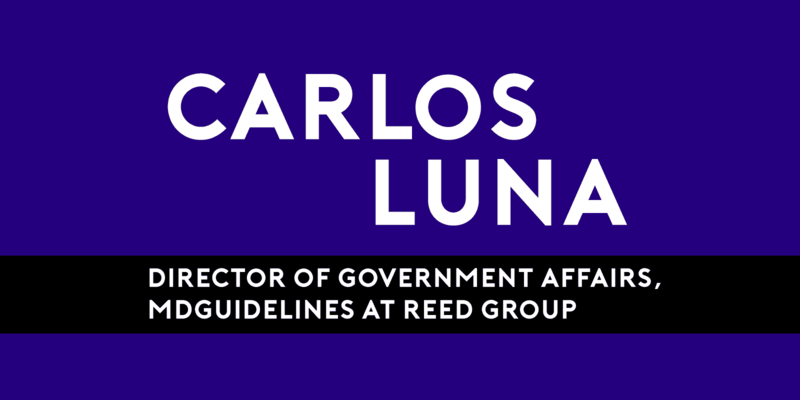 As the Director of Government Affairs at Reed Group and Medical Issues Committee Member of IAIABC, he is constantly on the hunt for learning and sharing newfound knowledge in this industry. He’s been personally affected by a close family member who had to go through a workers’ compensation accident, so his fight for what’s right is all too real. You have a very intensive job that deals with state-level government relations. What does the role entail and why does it mean so much to you to work in this environment? State-level government relations can be quite complex dealing with a myriad of issues ultimately affecting the development of public policy. However, the core of my role in workers’ compensation government affairs can be described with just a few words – patient and physician advocacy. It is my sincere belief that the dynamic contained in the patient/physician relationship holds the key to optimizing health outcomes, and thus cost outcomes, in each state. If legislators and regulators can identify and enact policies to help this relationship work efficiently and responsibly, much of the noise and dysfunction that we regularly deal with and read about in workers’ compensation materially diminishes. As an example, the prescription drug epidemic has generated much conversation across the country about adopting or creating standards of care to help improve questionable prescribing habits in the clinic. The lion’s share of activity has been focused on enacting policy to facilitate the enforcement of compliance to these standards retrospectively through utilization review and at the time that prescriptions are filled in the pharmacy. Little to no attention has been paid to finding ways to encourage prescribers to practice in accordance with the standards on the front end and avoid the friction resulting from UR and script denials on the back end. If we get the train back on track in the clinic, the opportunities for it to fall off the track down the care/claim continuum significantly decreases. The result: Better medical care – less friction – lower system cost – healthier workforce – improved state economy. Working in this environment means a great deal to me as it provides opportunities to contribute positively to the health of injured workers ultimately contributing to healthy state economies. Having a seat at the table that influences prospective statutory schemes that undergird the solutions to help injured employees get back to health, while lowering the cost of insurance, and stimulating increased investment by employers in these states that thoughtfully reform their workers’ compensation systems, is equally fulfilling and challenging. What has been the most difficult part of your job and how do you work through those tough moments? The most difficult part of my job thus far has been adjusting to the fact that politics occasionally may impede progress. In my experience working in the Guidelines Industry, allowing the evidence (through properly vetted scientific studies and/or data) to guide the discussion has always been the primary goal. In the legislative and regulatory environment, on occasion, the determining factor may not come down to identifying best form of evidence, rather what measure may be the cheapest and easiest to implement irrespective of its basis in scientific validity. Imagine going to your doctor and knowing that the medical care you receive may not be the best and most appropriate care for your medical condition, but it is cheap and it is the easiest path for everyone else involved in the process. This scenario does not make a lot of sense. Yet, I have been a part of conversations where bureaucrats verbalize that the reason a specific measure was proposed and passed in its form was due to it being the easiest path for the agency tasked with enacting the measure. Simplicity does not guarantee success and in the case of medicine (quoting a well-respected occupational health doctor), it is rarely cheap and almost never easy. The incident I describe above seldom happens and when it does occur, I intentionally spend more time reflecting internally versus externally. I focus on the elements that I can directly influence and try not to give too much mental real estate to the things that I cannot change. At the end of the day, I realize my job is to set the table for the feast (of information) and those who are hungry and seeking insight will sit, partake, and be better for it. I also realize that not everyone will want to sit at my table, or appreciate what I prepare and that is ok too – and I move on. On top of your busy schedule, you are also a Medical Issues Committee Member of the International Association of Industrial Accident Boards and Commissions (IAIABC). What are some important topics in this field that you advocate for? An important topic that I advocate for in our industry is to bring awareness to what constitutes true evidence-based medicine. The IAIABC has been such a great classroom, as has the Southern Association of Workers’ Compensation Administrators (SAWCA) for me and my peers in Government Affairs. Participating in these great organizations has afforded me a front row seat to information sharing among state regulators and other system administrators; it has given me the perfect vantage point to view workers’ compensation from a national perspective. It was through this involvement that it became evident to me that there is little known about evidence-based medicine in workers’ compensation. As of 2011, there were over 3,700 published clinical practice guidelines from 39 countries available to providers. To assist them to decipher which guidelines are safe and trustworthy, the U.S. Congress tasked the Institute of Medicine (now known as the National Academies of Science, Engineering, and Medicine) to initiate a study defining best practices used in developing rigorous, trustworthy clinical practice guidelines. The outcome was eight standards focused on developing content using approaches that are objective, scientifically valid, consistent, transparent, and free from bias. How do you hope to see the workers’ compensation and medical industry progress in the coming years? Two important shifts will happen in workers’ compensation as it pertains to the medical industry in the coming years: A move to value-based care (fee for value), and the creation of national standards (not to be confused with federal oversight) for key elements in the system. The total annual cost of lost productivity due to health-related conditions exceeds $225 billion in the United States. As such, employers are looking for ways to get the best medical results at the best prices for injured workers. More than 40 percent of employers are considering implementing value-based plan designs or high-performing networks. Medical providers who are unable, or unwilling, to adopt a value-based care model may find themselves left out of narrow networks in the not too distant future. However, value-based care—with its emphasis on coordinated and collaborative care—could help physicians lower costs and improve outcomes, as well as grow their networks by making their practices more attractive to payers. Value-based care will produce two key benefits: (1) Reduce unnecessary variations in care that can prolong health problems and delay an employee’s return to health and (2) Incentivize physicians for better outcomes based on the value of services and the overall impact on patients’ health rewarding treatments that lead to faster, safer and fuller recovery. Speaking with a prominent regulator, and workers’ compensation expert, recently reminded me of the need to establish national standards for key elements of the workers’ compensation system. Today, it is a system where variances from one jurisdiction to another seem endless and makes it unnecessarily complex. For example, did you know that the definition of “Employee” and “Contractor” varies from one state to another? The source of variability in definitions and standards from state to state can be hard to pinpoint. A lack of resources (expertise, budget, time etc.) seems to be the most prevalent reason cited by state officials. Select state agencies have voiced concerns with limited options for adopting evidence-based medicine content and tools due to a lack of a Medical Director, Pharmacy and Therapeutics Committee, and staff with expertise in the area of scientific research. In these scenarios, it would be appropriate to expect a state’s “limitations” to supersede the “needs” of its constituents under these restrictive circumstances. The more limited the resources, the less available options for these agencies to consider for adoption. Establishing national standards for key elements of the workers’ compensation industry can help level the playing field for small markets tasked with managing with modest resources compared to their large market counterparts and ensure that injured workers received adequate benefits irrespective of the jurisdiction. This is a loaded question and possibly an entire blog entry all unto itself. I work extremely hard to ensure that I do not trivialize the physiological and psychological impression left on someone’s life by a workers’ compensation incident. I have had the terrible privilege of witnessing a beloved family member go through a workers’ compensation incident. Even with a smooth care and claims process (thankfully the injury happened in the State of Colorado), there was still a significant adjustment imposed on my loved one due to the mental implications of the injury. I cannot imagine how much more significant the impact to their life would have been had the care and claims experience been less than ideal. In other words, injured workers have a lot to work through without the added complexity and stress that a poor-working system offers. The one thing that keeps me pressing forward amidst slow-going progress, and at times criticism from my peers wanting to preserve the status quo, is the realization that my small contribution to the discussion of workers’ compensation can mean a great deal. Especially to someone who is eager to recover from a workplace injury or illness and move on to the next chapter in their life – much like my family member.